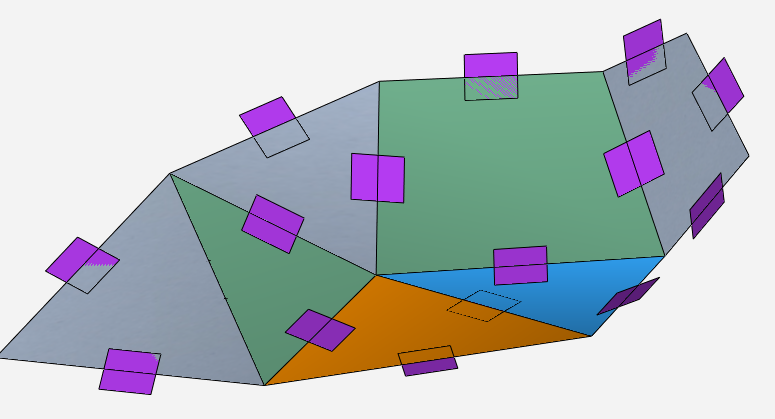 We are building an autonomous vehicle with a body consisting of tessellated planes. I’ve created the panels as a series of planes and now want to fabricate the body from a 12mm substrate. I need to create a file conprised of each panel as a solid object for CNC cutting with a 5 axis circular saw. The problem I’m having is finding the angle where the facets meet. If I thicken each facet select the top and bottom faces and loft between them I end up with edges that are twisted planes. Is theres way to create the file using any of the tools in FormZ? I’ve attached a file of a few of the surfaces that make up a section of the body. 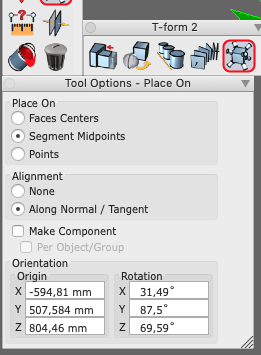 Select just each of the inside or outside faces of your object and paste them into a new file. Reshape each face by a uniform amount. Depending on external or internal fold, there will be some objects which intesecting ends and some which do not meet. Treat the two situations differently. For the intesecting ones, copy two intersecting objects and paste them into a new file. Modify intersect them and move a segment to point of intersection, then paste it back into previous file. You now have a face which you can extend face to. For the non-intesecting ones, use derive extrude tool on both ends, then cut and paste the two extrusions into new file, move a segment from point to point of intesection and paste back into previous file. Again, you have a face which you can extend face to. Gyro, Could you not just use the triangulate tool set to "Strict planarity test"? Which would convert all non planar quads and up to triangles. Or, you can force all (including planar quads and up) to triangles. Or do you need for some reason there to be quads+? Alan, problem is, if you move points on a segment (belonging to a quad) that does not intersect another, that quad will most likely become nonplanar. You could make sure that any movement belongs to a triangle, but if you have adjacent quads, this may not be possible. Also, may vary thickness a little. I do it this way: draw a rectangle (100x100mm) and use the "Place On" tool. Use "Segment Midpoint" and "Along Normal/Tangent". select the rectangle and then the object. Now you can measure the angel on each side of a face for your cutting machine. I was wondering about the PlaceOn tool as to will give a fixed line where 3 facets meet, but the resulting lines are not parallel resulting in a twisted face, I need to make each part as a solid for programming. you have to align to midpoint of segment ! Or consider 'lofting' perpendicular from the xy plane, to get all planar edges, everywhere, if that was the objective, but if you use the Triangulation tool (as already suggested), set to strict planarity, second option , (this worked here), then ... What is wrong with having two faces on some of the edges and milling it, just so? After all. in joinery, many faces per edge is considered smart, if they don't feather too much to a point of weakness. Thanks for all your replies, the "Place On" I considered also but does not solve problem. Alan, I've tried extending all top and bottom faces and creating lines from where they intersect and don't end up with planar faces, unless I'm doing something wrong which is highly likely. I'm not sure of the methodology of aligning the midpoints from via. And Bo thanks for your input also but the the 5 axis circular saw will only cut planar faces, I could cut with a 5 axis router and just supply the file with twisted edges, but the process is slower and anyone with these machines are busy building boats for the Americas Cup. I think I have it following Alan's comments but stayed in the same file, image attached I'd be interested if there is a more streamlined solution. PS Every time I attempt anything in Fusion 360 I end up back at FZ! So, to be clear, what you are looking for is notated in Red? Are they still planar once you move points around? Are your Surface planes still planar? Personally, I don't think it's mathematically possible to create this particular shape where all the adjoining faces are tessellated, non planer and still have the intersection points and outer edges lining up and still be planer. I believe you would only achieve this if using equilateral triangles (not just any triangulated face). If you are machining this from 12mm ply for example, then you only need to have the tessellated butted faces as planer faces (your red faces shown), but with added thickness of say 1mm (use the thicken tool set to centre) differenced from the extruded faces of 12mm. The outer boundary face edges would still not perfectly line up so would have to be planed after assembly. So my hint was to use the midpoint of the segments (best compromise) to get the angle of the mitre ! And as Des said. "The outer boundary face edges would still not perfectly﻿ line up so would have to be planed after assembly.﻿"
I think I've have solved the problem along with help the replies submitted. 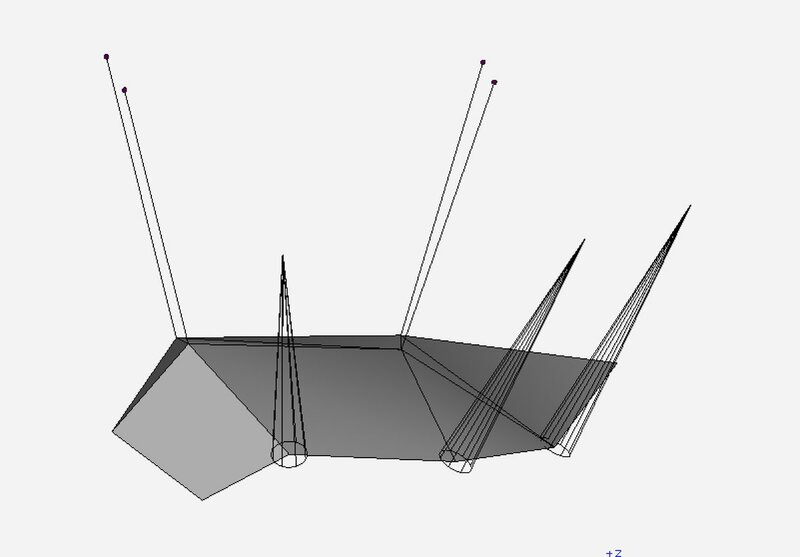 Basically I need to choose between non planar faces, non planar edges, or edges where the facets intersect not aligning. I've chosen the latter as I can sand of the overlapping areas still keeping the points of to outside skin colinear. I've attached a file if anyone is interested or has some feedback. In answer to you last comment vva apparently a 5 axis circular saw is capable of cutting non planar faces to a small degree, but I suspect cutting 2 parts wouldn't result in a perfectly mated join between faces. Failing all the above I'll just cut steeper angles and use a thixotropic adhesive to bond them and act as a gap filler.